I’ve seen some thin flash drives that use USB ports for power over the years. 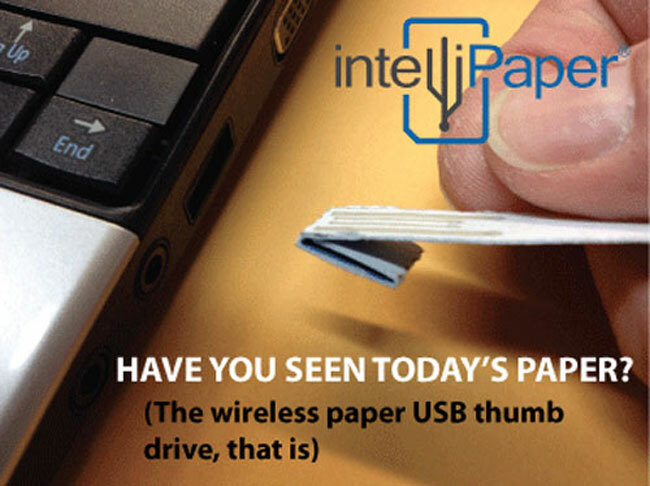 I think the thinnest of ever seen maybe the new intelliPaper flash drive that recently launched. These little flash drives put the USB connectors and the storage chips in a thin piece of paper. I think it’s impressive that they can fit NAND flash storage and the USB contacts onto a normal piece of paper. This opens the door for people to be able to use the little flash drives as wedding invitations, event tickets, gift cards, and just about anything else you can think of. The company behind intelliPaper is seeking to raise $300,000 to bring the product to market through Indiegogo. Through the funding program if you pledge at least $100 you get your own USB writer and a stack of 10 of the little paper flash drives ranging in capacity from 8 to 32 MB. Note, that capacity is in megabytes so these are small capacity devices.